○ Please use the request form, it makes things easier for tig. ○ Post 'is a smelly old lardface' at the end of your request where it says tiggertine: so I know that you've read the rules. Hehe, yay for text tool! Thanks so much, Tig!!! They're great! Pic: Any pcture of Doofy in his cute/(some other word) state. Just as long as it doesn't repeat itself or is the front view of his face (it looks as if he's magically gained fifty pounds and I don't like that and it just disturbs me, I like meh THIN, oh yeah, and please no speedo pictures, I'd rather him have his labcoat on just in case my mom goes to my computer and finds out how obsessed I really am, then she'll worry about my mental sanity even more, and, she's a preacher and doesn't like that stuff. Boring, right?). 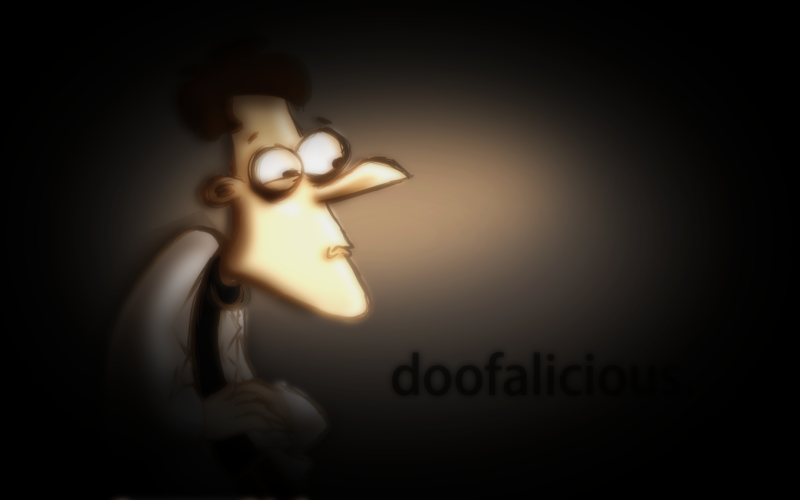 Text: 'Doofalicious' (have it on the right corner or something, not at the bottom but more towards the bottom, and don't make it like HUGE or anything, just readable and looks good, the color doesn't matter to me as long as it matches either Doof, the image, or well, both Doof and the image). Size: It doesn't matter since I'm using it as my wallpaper but I'd like for it to not be all stretched out and fat-ness just to take up the space on the screen, nor do I want to have to be scrunched up but out of the two, I like scrunched better). Anything Else you'd Like to Tell me? : Well, I'm using it as my wallpaper (reminder) so I want it to be large enough so that it doesn't have to stretch out to fill the screen but small enough so that it doesn't have to be srunched up to the extreme. You can also put a whole bunch of random pictures of him togther when he's being cute/(some other, much different word). I'd rather not have Perry in the picture(s) because he is not in my top five favorites list and rather not him ruin the moment of staring at Doof but it's okay if you do. I don't really care what you do whether it's random pictures of him all put together or just one picture of him (and if it's random pictues, make 'Doofalicious' much bigger, bolder, and more centered). That is all. Hope it's no too much pressure and as long as it's finished by April 2010 I'm fine (I can be patient if I want to). Tiggertine: is a smelly old lardface. Just to make sure it doesn't stretch out or 'scrunch', what's your monitor resolution? I think it (feminine Phineas) looks wonderful despite not looking so natural. It reminds me of those fifty dollar pictures you find in mueseums that are going out of business!! Err... it reminds me of those "naked lady" pictures that are quite expensive and only go to the aboslute finest muesuems. There, the second description was so much for pleasent, don't you think? That part of your post needs to be in the FanArt thread, as I have already said. No, not all that much, mine's bigger. The part where Django asks his dad about coming with them, but turns him down, then shakes his head around, the next shot with his eyes open I'd like, please! Also, could you provide me with a Disney XD logo picture. Thanks! Wow! Great pic! That should definitely be for someone's signature (or profile picture. Seems a little dark, and rather big for a profile avatar. Sorry I hadn't replied earlier! I haven't seen this until now (because I logged on and then I exitted out with new posts still un-read and when I re-visited it didn't show them as new so yeah... ). Anyways, it is rather dark, I can't see Doofy and glorify him, but it are is okay. I require some help in making an avatar from a larger sized picture that was taken from photobucket. Does anyone know how to do this? On a Windows computer, if you don't have Photoshop, I think using GIMP would work for you. Graphic I'd perfer (prefer?) JPEG, but PNG is fine. Either 1! Pic A whole bunch of different pictures of Ferb. But nothing disturbing because this may be a layout or my YouTube account, and Rachel is disturbed very easily so I don't want her to get freaked out. I don't wanna be freaked out either. So, yeah, good pics. I beg of you... Just his normal outfit, unless it's like, a really cool outfit. By cool, I mean "Baljeatles" type outfit, or CSI Miami type from "Finding Mary McGuffin". What I'd really like is a pic of him in Meap's tricked-out spaceship. And a pic of him and Vanessa. Aw, yeah.. He's my screen saver, so I don't really care what Mom thinks! Text "Man of Action". Somewhere in a place where it doesn't block much of a picture. But make it so people can read it, too. Small, but not too small. Catch my drift? Size Ooh, toughie.. When it comes to size, I'm not a big expert. But you know the size an image has to be fore a YouTube layout, right? 256k maximum, right? I'm not exactly sure... but yeah, it's gonna be a YouTube layout. Anything Else You'd Like To Tell Me? Nah, not really. But make it really... cool, altered-color like. 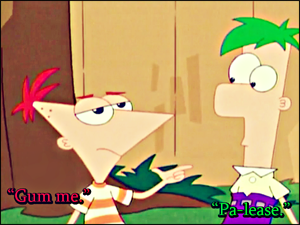 Kinda like your video "Ferb is such a womanizer", but not disturbing, even though I like that video. Again, gonna be a YouTube layout, so clarify that size if you need to. No rush, no deadline. But please make it before 2010. I'm a smelly old lardface indeed. 8D Right on it, after I finish the English paper that's been irking me. What does GIMP stand for? My GIMP is being retarded. It won't let me color anything anymore. Stupid freak of technology. Finally. It's finally working again. Problem is, I don't exactly know what to do with it or how to use it entirely! Ha, that's a bad problem. Hey, Tig, do you know how to make moving avatars? If so, I've been blessed with a brilliant idea! If not... I'll just stick with the one I stole from Google Images.